I have had a great adventure in one of Europe's best natural playgrounds: Wales and it's natural surroundings. Wales is undoubtedly an amazing country. Going on a roadtrip, we discovered some stunning and diverse landscapes, mountains, valleys and some incredible nature. I will take you on a visual journey from Snowdonia to the Shropshire hills. The flight from Amsterdam took approximately 45 mins, so it was really quick. Being back in the UK is always great. I like it here and with my partner being English, it is always great to be visiting here again. After collecting our bags and equipment from all the necessary areas, we set off to obtain the hire car. Thankfully, Hertz was really good to us and offered us the fantastically equipped Fiat 500x. It was a great car, comfy, powerful, easy to ride and economical on fuel. With the wheels rolling, we set off west. 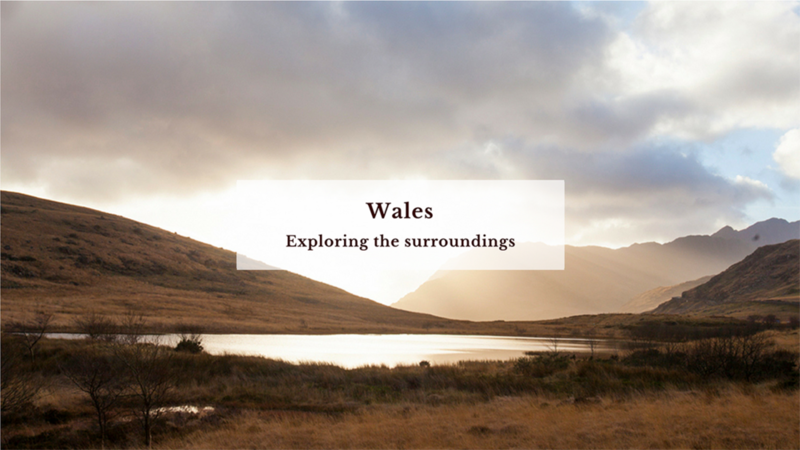 As my partner has been to Wales many times, he provided me with relevant tips on the best places to see on beautiful locations in the north and mid Wales. As previously mentioned, Wales is undoubtedly a fantastic country, with stunning landscapes and a 'getting away from it' kind of feel. Even during the busier seasons (like summer) it never seems to gets too busy. Perhaps unless you head to the beach on a sunny day, or try to conquer Snowdon in the perfect conditions. I guess these could be the usual tourist traps, but visiting so soon into the new year provided us with the chance to explore in a quieter context. After leaving the urban landscape of Birmingham, you soon enter the peaceful county of Shropshire, which borders Wales and becomes the stepping stone from England to Wales. Shropshire is a nice county, with a strong rural feel and beautiful quaint villages dotted all around. The country lanes are fantastic, with high hedge rows lining the sides of the roads and sweeping bends that are fantastic for testing your driving skills. Knowing the area fairly well we looked for a suitable route that would offer us some great spots to stop along the way and of course potential spots to take some stunning pictures. The tourist trail offers many great locations, but we prefer (as travellers) to take the alternative routes to find special -and possibly- unique and different viewpoints from the norm. An old relic in the fields of Shropshire. We took the M54, A5 route to Shrewsbury and then decided at this point to come off the main route and take the back roads towards the beautiful Lake Vrnywy. It turned out it was a good decision to make, as the route was quiet and allowed us to see some spectacular sights along the way. The roads are narrow and twisting. Lined with naturally rich hedge rows and home to extensive, sprawling farmlands. The landscape here is undulating and the rolling terrain provides opportunities to take some nice rural images. In the distance you begin to pick out the Welsh mountains that stretch as far as the eye can see, from north to south. Lake Vyrnwy isn't actually a lake, but a reservoir that provides water for the City of Birmingham and the surrounding areas. The valley was flooded many years ago, with the intention of providing water to the nearby urban conurbations. It is a stunning place, set in a stunning landscape. It is home to a wonderfully structured stone dam, which was built in the 1880's and was the first of its type. After parking the car on the small car park you can walk your way across the dam, from one end to the other. Here you have a drop one side, with nature walks in the valley and on the other, is the large expanse of water, that forms the main body of the reservoir. View from the dam at Lake Vyrnwy, Wales. Walking across this architectural splendour. After taking in the beauty of the dam, we set off to drive the around the lake. This drive is fabulous and something everyone who visits, should experience. It has many twists and turns, but is set within a spectacular landscape of lake views and thick coniferous forests. The trees here were amazingly high. Towards the bottom of the lake we discovered a beautiful spot that is relatively secluded and quiet. Here you can walk down to the waters edge, sit of the rocks and take in the beauty of nature all around. It is a stunning spot and words cannot really describe how it makes you feel, but it is peaceful and not to be missed. By the shores of Lake Vyrnwy, Wales. Great views over the lake from here. Slowly, winding round the lake you discover another gem. That is the tower on lake Vrynwy. The tower is 154 feet tall and is set just off the shore line and situated on the opposite side. It is a beautiful structure that helps to form a great backdrop for any photo-graphical opportunity. Its appearance is pretty unique and its function is to filter materials from the lake. The famous Lake Vyrnwy Straining Tower. When leaving the lakeside area we climb up into the nearby mountains, which are again covered in rich coniferous woodland and head towards our overnight stay. For this evening, we are to stay in the small village of Llanarmon. The village is set in a stunning location with again narrow winding roads and steep valley sides. Our accommodation was at the Hand of Llanarmon, which provided us an excellent stay. Our hosts Jonathan and Jackie Greatorex have clearly worked hard and established a wonderful hotel in a fabulous location. The accommodation was perfect and the food was divine. It's definitely a recommend place to visit, if you are in this area. On our second day we went towards the Welsh mountains. We left early to make the most of the day. The route took us high over the Cambrian mountains along roads that were quiet and perfect for driving. Our chosen route takes us up on the road towards Blenu Festiniog. Climbing roads through the mountains of Denbighshire, Wales. Outside the small town of Bala you reach the popular stop off called Afon Tryweryn. Yet again, here is another stunning reservoir and large body of water, surrounded again by a spectacular mountain panorama. The light here was fantastic. It's definitely a stunning area and perfect for a picnic and viewpoint by the side of the road. In fact, this area gives you every reason to stop and take pictures, as we counted at least 12 stopping points, where you can simply enjoy some great surroundings. Sunny views over the Welsh valley. We head towards Blaunau Festinog, but take a quick right turn to explore an area close by. This area is high in the mountains, remote, beautiful and unique. It was an area once used by slate mines and after the mining industry declined it has left behind a strange 'lunar landscape' feel. It is unique and certainly gives you the great impression that you are out here on your own. It is prefect for capturing the essence of silence and certainly helps motivate you to capture some stunning shots. The open expanse of Blaenau Ffestiniog, Wales. After not seeing anyone for many miles and certainly not seeing a dwelling. We stumble across a small cottage and have to move the car over to one side of the road to let the Postman pass. It was a funny moment, as one moment you feel you are completely isolated, but the next you realise that life still does exist. Furthermore, it also leaves you with the impression that great history has happened here, as there is a slate 'mile marker' sitting by the side of the road. It measures the distance from one location to the next. It is old and shows that it has been there for many, many years, probably as long as when horses and carts travelled the same route. Snowdonia views. Towards the Ogwen Valley, Wales. The Ogwen Valley. An outdoor paradise. We head through and travel down the A5 through Capel Curig and into the stunning Ogywen valley. Here you will discover an amazing valley that is home to spectacular mountains and stunning lakes. A true paradise for walkers and mountaineers. This area is home to the true giants of Snowdonia and is a must see place. With the ever changing weather conditions here, you can take some amazing pictures. We spend some time here to experience what gems it has to offer, but due to its proximity in the shadow of the sun, it can get extremely cold in the winter months, so it is important to wrap up and be prepared for any eventuality. It is a very unforgiving landscape and should always be treated with great respect. As the daylight slowly diminishes, we decide to pack up and move round into the other valley and travel towards Mount Snowdon. Snowdon is a beautiful sight and is Wales' largest mountain. Standing at 3,560 feet it dominates the surrounding landscape. It is of course popular with all types of walkers, who desire to reach the summit. There is of course a variety of stunning routes to the top, some of which are relatively straightforward, some rather technical. Alternatively, you can take the railway to the top, both of which are definitely something to do. Llynnau Mymbryr in it's shining splendour. Our route leads us past Snowdon, so we stop to enjoy the mountain and the perfect sunlight that is on the display. We eventually will travel and end up on the beach, in the valley below, but while we are here we are greeted with the most amazing display of sunlight above the Nant Gwynant valley. So we stop and of course take some moments to capture what we see. Nant Gwynant sunset, Snowdonia, Wales. Eventually, we peel ourselves away from this perfect location and move towards the sea. We head towards Harlech. Harlech is a favourite spot, as it not only has a wonderful castle that dominates the landscape, but it has the most amazing beach and dune area, probably on the west coast of Wales. It is a perfect expanse of sand, popular for walkers, beach lovers and sunbathers, in the summer months. In our case, it was the perfect location to grab a shot of sunset, as the weather had been cold and clear throughout the day. Luckily, the clouds were relatively light and isolated later that evening, for the moon and Venus allowing to shine in some great evening shots. On route towards the dunes and Harlech Sands. Duneland with a Snowdonia horizon in the background. As darkness descended, we ventured towards our second night of accommodation, which was the Victoria Inn in Llanber. Here we found a nice and comfortable place to stay, positioned close to the main road and situated in the quiet village of Llanber. Again it provided us with the perfect stopover on route, with a comfortable room and good hearty food. The next morning we woke up early to catch the perfect sunrise. We set off in the dark and head southwards, down the coast route and then turned east, back into the mountains. Rhydymain and the mountain climb. Passing the popular seaside resort of Barmouth and inland towards the small town of Dollegeu. Once out of Dollegeu, we ventured up the steep climb, back into the mountains. At the top of the long, winding road we noticed a small car park full of people. It seemed strange to have a car park so full of people at 7:30 am, so our curiosity led us to make the stop. At first we thought it most be the perfect location for sunrise shooting and that all of the people present, were here to capture the early morning sun. After few conversations, it did in fact turn out that all of the people present were plane spotters and they were there to witness the spectacular Mach Loop. Looking back I think it was all a coincidence, so we proceeded up the mountain and to not only experience a wonderful sunset, but also the possibility of a flypast by a modern fighter plane. Unfortunately, on this occasion we had probably arrived a little too early to experience such excitement, but to be in such a place was pretty amazing and definitely makes it high on the list of places to come back to. Regardless of the the planes flying by, the scenery was fabulous and valley turned out to be pretty breathtaking as well. After spending some time here, we moved off down the frost bitten valley and winded our way onto the A483 in the direction of Welshpool. Again, wherever possible we tried to plan our route to go slightly off the main roads. We would be heading in the direction of the Shropshire Hills, which is situated towards the south of the county. It was probably a distance of around 50 kms or so away, but with the narrow and winding roads, it tends to take some time. Eventually, we crossed the border out of Wales and again entered England once more. Here you leave the rugged landscape of the North Wales mountains and enter the lower levels of mid Wales. The countryside here is more like rolling hills, farms and woodlands all around. Our first stop was the sweet village of Clun. On the outskirts of the village were the ruins of Clun Castle, which we explored. The surrounding countryside is so typical of rural England and probably hasn't changed for hundreds of years. It felt like stepping back in time really and was a great experience. From here we ventured north and followed the narrow Shropshire roads up to another popular location: the Stiperstones and the Long Mynd. This area is again beautiful and a must see for any walker or landscape photographer. The landscape is here is elevated, with fantastic views all around. The Stiperstones is unique place. It is an 8 km ridge comprising of a collection of rugged rocks with stunning views. As being a protected nature area it has an abundance of diverse wildlife like many owls and grouses. We walked up and made our way (off piste) onto the jagged rocky outcrop. A Shropshire view from the Stipperstones. The rocks are stunning with rugged formations, so to reach the top is a bit tricky, but definitely worth the effort to witness some spectaculair views. We were lucky to capture an amazing sunset again. The weather had been sweet to us during the whole visit, with cold and crisp air which, allowing us to take some incredible shots. Thoughts in the mid day sun. Next, we meandered across towards the Long Mynd, which is another unmissable stop, with breathtaking roads and dramatic views. After crossing the summit we started to again drop down into the valley and stopped off in the wonderful market town of Ludlow for our last overnight stay. An old town, again a must see place. Our accommodation was excellent, at the Feathers Hotel. A truly remarkable hotel and historic building with a stunning appearance. The hotel dates back to the 17th century, where it was an established coaching inn for visitors to the area. Since then it has been renovated to house guests and establish itself as a premier hotel, but many features still remain the same. Ludlow itself is a picturesque town, with small quaint shops, an variety of nice places to eat and drink, together with some great sightseeing spots, like the nice castle and church in the centre of the town. It was an ideal location for us to stay over and move on from, before heading back to the airport. Historical Ludlow, Shropshire. A picture perfect market town. Sadly, it was time to head back to the airport again. The trip had been fantastic and we both wished for spending more time to see one or two more places high on our list. But before heading back, we took a quick stopover at Ironbridge, which is again a stunning location. Located on the river Severn and a village steeped in history. The Ironbridge spans the river severn (England's longest river) and is made of cast iron. It was opened in 1781 and highlights one of the many shining examples of British Industrial History. The village that surround the bridge is also a very nice place, quaint shops and cafes, with narrow winding streets that have a huge amount of history attached to them. The Ironbridge circa 1779 and the wonderful River Severn below. After a quick, but fantastic lunch in Ironbridge, we arrived back the airport to catch our short flight. The trip had been a wonderful experience for us both, I loved visiting some new places and my partner Gareth of course enjoyed being back in his motherland. Although the visit was short, it gave us a good insight into just how beautiful Wales and the border counties of England are. It is definitely an area of the UK that should be explored. We would like to extend a huge thank you to @lovegreatbritain_nl, for providing us with this wonderful opportunity and for all of their efforts in the organisation and making this trip a great success! All content on this site ┬ЕClaire Droppert 2019. ALL RIGHTS RESERVED.